The unique front fascia of the 2019 Toyota Tacoma features a honey-combed grille, wideset headlights, and a lower skid plate that give the 2019 Tacoma an athletic and aggressive exterior appeal. 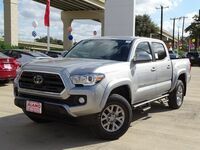 The eye-catching 2019 Toyota Tacoma has two powerful and efficient engine options that provide plenty of horsepower and towing ability while still sipping the gas. 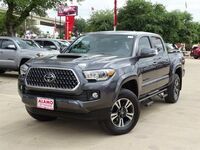 You can learn about the two available engine specs along with the standard and optional equipment of the 2019 Toyota Tacoma right here below and you can see the capable and comfortable 2019 Tacoma at Alamo Toyota in San Antonio, TX today. What are the Engine Options for the 2019 Toyota Tacoma? 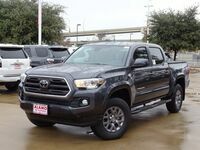 The standard engine of the 2019 Toyota Tacoma is a 2.7L 4-Cylinder that supplies it with 159 horsepower, 180 lb-ft of torque, and a 3,500-pound towing capacity. Under the hood of the TRD Sport, TRD Off-Road, Limited, and the TRD Pro trim levels there is a 3.5L Atkinson Cycle V6 engine that delivers 278 horsepower, 265 lb-ft of torque, and a 6,800-pound max tow rating. Four-Wheel Drive (4WD) is offered for all six trim levels of the 2019 Toyota Tacoma for confident driving over any terrain. Both engine options pair with a 6-Speed Automatic Transmission for optimal fuel economy. 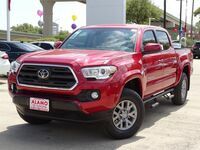 There are also two cabin size choices for the 2019 Toyota Tacoma as well as two bed length options that make it easy for you to find the passenger and cargo space that you need. An Access Cab is standard for the SR, SR5 and TRD Sport trims and provides seating for four people. The Double Cab has space for five passengers and is an available option for the SR, SR5, and TRD Sport while it is standard for the TRD Off-Road, Limited, and TRD Pro trims. Standard interior amenities for the 2019 Toyota Tacoma include a 6.1” Touchscreen Display, a 6-Speaker Stereo, and Bluetooth® Connectivity. Upgrade to the Limited trim level and owners are rewarded with a 7” High-Resolution Touchscreen Display with Split-Screen capability, HD Radio™ w/ Predictive Traffic & Doppler Weather overlay, and a JBL stereo system. 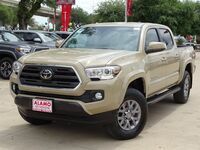 You can take the 2019 Tacoma for a test drive today at Alamo Toyota to experience its capability and cabin comforts firsthand.